Here’s a recent story in the Bangkok Post about a seventeen year old Australian named Jesse Martin. I loved to sail when I was seventeen but growing up outside of Philadelphia meant that my time on the water centered around family vacations to Cape Cod and sojurns to my best friend’s beach house on Delaware Bay in Cape May, NJ (see the Hobie pitchpole post). As we all did, I had dreams but at that age...they did not include sailing alone around the world. Apparently Jesse, a modern day Robin Lee Graham, is made of sterner stuff. 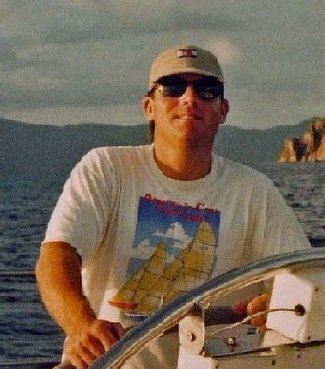 Martin began his voyage on the 33 foot S/V Lionheart on December 6, 1998. On October 31, 1999 the Lionheart sailed back to Melbourne after covering more than 27,000 miles around the world. He has, of course, written a book about it called “Lionheart.” I haven’t read it so I can’t say for sure but given this brief report of his trial, I have a feeling that it’s every bit as gripping as Robin's book, Dove. His home page is great reading. Kudos Jesse. You had a bit more room (Dove was only 24 feet LOA) but you both went the distance. "When there were things going wrong with school and family, I imagined myself on the ship and sailing off," said the young man, who was born while his parents were on a backpacking trip to Asia and Europe. He said that a love of travelling was instilled in him probably when he was in his mother's womb. Dove still endures as a classic novel of young adventure, but if I see this one on the shelf, I'll give it a look. Note: a little more than half-way through his circumnavigation, Robin Lee Graham became disgusted with his adventure and wanted to walk away from the whole thing. This may have been Australia, but I'm not certain. There's the book on the shelf only six feet from me, but I"m too lazy to get up and find the page). National Geographic (who was sponsoring the trip and had an interest in its successful completion) bought him a larger boat (just around 33', I believe) on which to continue his voyage.